Every child goes through a skate boarding phase and wants to become the next Tony Hawks charging huge ramps and doing awesome tricks, but as a parent getting the right skateboard for your kid can be a hit or miss. Depending on what kind of boarding it is exactly your kid is looking for, it’s sensible to ask and get a rough idea first. He could be wanting to start long-boarding or more commonly short-boarding, so whatever the reason just make sure you have an idea before making any purchases, which will ensure no unwanted returns. There are few different types of kids boards and I would recommend getting yours into one he likes the look of, but generally the rule is the smaller the kid the smaller the board. The table below might simplify things.. The simple rule is – the smaller the board the easier it will be for the beginner, unless the kid is really tall and then the rule turns on itself. The mini skatebaord can be ideal for campus, school and hanging around out at the park, unlike longer boards which might need a longer surface area for use and downward hills. The board shapes are smaller than most standard ones and can have a kick slip or kick tail end decks, which have option for different features, but if you’re a parent wondering what the heck am I talking about then skip this and move onto the next section. Kids starting out won’t know the difference, but one done a full summer at the park might, again keep updated with where he is at. Some short board tricks kids love to do is the kickflip and if you want to impress your child then ask them if they have managed one yet? This is usually the first trick learnt on a skateboard and sets the standard of progression, which lets you know how advanced a boarder they are. However, if your kid starts to mention inward heelflip and how they have done a backside shove-it with a joined heelflip then maybe it’s time to let them choose their own board. Longboarding is becoming more popular with both adults and kids, its history started around the 1940’s onwards and is increases and for good reason. The longboard can be faster and suited for varying terrains, like long downhill situations and such-like. This however means that the skate park might not be ideal, so if you’re local has one maybe best to shorten things up. Normal deck sizes for a skateboard are from 28-30 inches long and a longboard is 22 inches to 45, so a noticeable difference. Longboards have softer wheels and are great for those surfaces that are not completely smooth, so again think about the area your kid wants to practice at. Longboarding tricks are slightly different and usually consist of ollies and ones with nose manuals, which focus on the boards shapes and features. So, if your kid hasn’t ever done boarding and you want him to get him outdoors playing with other children and think skateboarding is a great solution then before getting a board and sending him on his way I would suggest getting the right protective gear in place first. However, maybe it’s not his first time and he’s a regular skater, so being seen with all the gear is a No-No and less important, but I’d still try and get them wearing one. The joints are always the weakest links, but if the brain gets a knock all the joints don’t matter so much anymore, so ideally I’d start with a helmet and work your way down to knee pads. From personal experience of having weak wrist joints I like wrist guards and these make the hard fall a little less painful, but honestly if it’s their first time I’d get them suited and booted, as they say, and make sure the first time experience isn’t ruined by a nasty fall. Helmets provide the necessary protection in the unfortunate circumstance of a fall or crash. This bit of gear is not to go skateboarding without and should be worn no matter the situation. Head injuries are common with skateboarding, but this is usually down to lack of protective gear, which would of prevented the injury in the first place. Helmets come in all colors, shapes and adjustable sizes and save a child from dying potentially, so it’s really about how much do you want to spend, because you should have a helmet, if not already? The more expensive doesn’t mean necessarily better, there are thousands out there and it’s maybe just good to get one that is the right size and is with the CPSC (Consumer product Safety assured). The importance of a protected wrist ensures that they won’t have any broken bones in that location, which is really important for those who know what a kid with broken anything is like, like I do, so a little protection is worth it in the long run, especially at the early skating stage. Quality does vary and some brands offer better quality than others, however the usual material is made from a hard plastic and very durable. Some offer EVA padding on the inside and make those hard falls even easier to handle, keeping them pushing harder and faster. Most come with elastic straps and can fit the child’s size and shape, but ideally a snug fit is what you’re looking for, so if you do accompany them make sure it’s a good fit. This can save a shoulder from popping out of place and make the falling part a little less painful, so making sure this little add-on is given, because nasty pain with stop the learning process from continuing for the eager little skater, even the possible next Tony Hawks. I would normally recommend a bundle of all padded protective gear to be used in conjunction with each other to give a rounded protective bubble of potentially weak areas that could get easily damaged. This awesome skateboard can be used with a remote control or by the power of the kids themselves, it’s the latest in SWAGBOARD technology and makes the new generation of electric skateboarding awesome fun. The comprises of rear motorized wheels that are charged by the control box and can be easily switched on and off by the power button. In the box that arrives there is a user manual, wrist strap, remote control and the Swagboard itself. Ok, so I have added this in for those parents that have kids that have been on the block for a while and want to have an awesome gift that will rock their world for a while. This electrically charged board has swag as the name suggests. The Maple deck grip tape for handling makes this a comfy ride. The remote control and accelerations functions is a sweet feature and sure to keep them going. The board itself is long and will be a real cruiser with a capacity to reach a top speed of 11 mph for up to 4-11 miles. The remote control is easy to use and has a micro USB port for charging and a throttle nob for acceleration and braking, which is a simple press forward or back to change speed. There is a skateboard battery indicator and makes cruising easy and with the remote battery indicator you’re in control. The max weight is 176lbs or 80kg and is designed with a Canadian maple with polyurethane passive wheels and the wheels at the back, which are motorized, are rubber with 24v also connected to the battery which contains 24V of lithium iron phosphate. The board even lets you know when its running low of juice, which is ideal when out and about. The board can handle huge weights of up to 176 pounds, so most kids can handle use this. I would recommend for an older kid and one that is used to cruising high speeds already, it’s a serious toy and will be loved, but not everything or everyone is ready for it, so be warned. HOWEVER…There has been a lot of faulty boards and complaints about this skateboard. Some people say the battery is inaccurate and indicates faulty and flashes too soon after charged. Furthermore, the brakes are sensitive and making sure to lean back when braking will be advisable. This short board cruiser is the first in this skateboard comparison review and I choose this for its basic durability, price and style. All kids want to make the most of their first board and I think if the child is under 12 years of age this would be a great first board. The High density plastic is going to hold up to any ruff play and I doubt they will be doing any tricks like 360 ollie off a rail at height’s that might need a board with superior design and construction, but even if they manage to do such a stunt this board would still hold up, it’s a good one! The wheels are smooth and 59mm if you need to know, bearings stainless steel and the hexagon patterns are unique to this board. The board comes in all colors and the wheels can be changed if you wish, it’s easy to customize and suits your kid’s wants both now and in the future. The trucks of this skateboard are 3 inch aluminum and colored blue with a high quality cast to ensure that can handle high impacts. The trucks are made from a dense baseplate and hanger which the axle runs through. This is where the bushings connect and every skateboarder wants these to be good quality. Some children are even very particular about these rubbers or cushions (also known as) and even have terms like grommets to enhance the name of them, but really there function is to cushion as the board is turned. 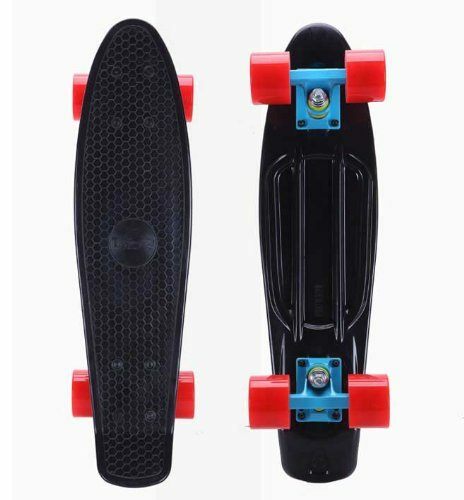 This penny board usually has wheels that are made from 59mm 78A super smooth urethane wheels, which are plastic and strong to the core, but variations can be chosen and kids often adapt to suit their turf. The deck of this board is 22″ x 6″ and is very dense with a plastic that has been molded into a hexagon pattern. The flexibility and strength of this deck is ideal for handle rough use and textured for stability. All parts of this board can be reassembled and adapted to suit your kids color tastes and preferences. This boulder board is a unique looking board and has a shorter history than some of the others here in this review. Scott Peck originally designed and engineered the board way back in the 80’s in Colorado. The width and shape are noticeably different and has been viewed as a nice adaptation of skateboards to the growing number of unique styles and designs. The rails on this skateboard are subtle and the footing is easily placed for easy handling and managing turns. The design is made for control and handling so some kids might prefer this board to start with if they are not used to riding. The trucks on the krptonics board are larger than the tiger board and have 6 inch heavy-duty styled trucks. The graphics and krypstik logo are awesome and come to a multitude of colors and styles. The bushings are made from urethane plastic and are a soft 88A. The wheels are polyurethane wheels and made to ride smooth with a size of 60mm x 40mm. The bearings are made from carbon steel and endure the test of time. This is easy to use a thick board with durable maple wood for decking and a hard in-lay bottom. This board is easier to use than some others that are being reviewed today, simply due to the cruiser design. The board itself comes recommended for 8+ years but if they have developed quickly and naturally more capable than their peers you may deem is fine to start them younger. This board can handle large and will hold up to 220 lbs and with the 88a bushings and 12mm pads, it will hold heavy with speed. This kids skateboard is on the lower price-end and is made of wood, although the type is unknown and not specifically stated. This board is, however, a great first-time user board and will make a great gift for introducing the little ones to the cool world of skating. The graphics are of a skull and if your kid likes the wacky world of art and the untoward then he will get a kick out of this. I would recommend this for most ages and the one definitely to introduce them to the sport. 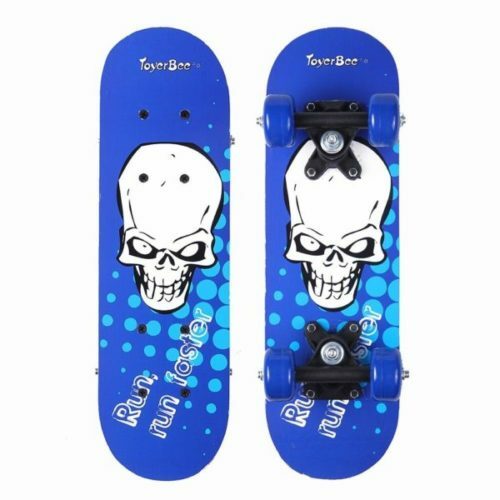 This is great mid-sized kids skateboard at 31 inches and the price is reasonable also coming in at the low-end price in this review, which is good considering the design itself is to be admired. The deck profile is concave and gives for supreme control while cruising when combined with the awesome ivory wheels at 54 x 36mm. The alloy trucks both front and rear offer new-seagull 5-inch heavy-duty material and design. The wood is Canadian maple with some high-quality double kick features in mind, so when a boy starts to think about that kick-flip it’ll be worth noting that when this spins on itself the design gets displayed to all. This boasts superior control and agility. The bearings and pads allow for greater speeds and the 5-inch wheels handling turning and maneuvers. The design is a cherry blossom and very attractive with a heavy-duty grip. The board requires no putting together and is ready to go and be ridden. The Board Blazers skateboards began with Greg Rudolph from a University campus in Arizona when one dark Christmas night met a Greg cruising with a duck-taped deck. The LED under-glow soon became a hit with skateboarding community and became this latest in innovative skateboarding ideas into fruition. This board blazer lights and is a real spectacle, especially when the sun goes down, it’s a real head-turner, simply place the lights underneath using the adhesive and away you go. This is a unique way to customize your board with glowing blazers that can be used for vivid effects that beam to others. They are super lightweight and don’t slow you down, which ideal for riders. The lights are easy to replace, long-lasting and just need batteries to keep things bright. These are great as gifts with loads to choose from and last ages, but if they run out simply change the battery and they will continue to display with the lithium batteries that last ages. This pack comes with 4 lights and can be easily turned On/Off with one quick switch. This will turn heads, guide the path for others and stand out from the rest, which is what they’re all trying to do at that age. The Tiger skateboard is the best overall and offers great features and design. The wheels are smooth for easy riding and the trucks hold well with premium quality. The turning is smooth and will be great for the beginner or the intermediate skateboarder. The overall stability is good and the deck is small compared with some, but it’s a fantastic board and will be a great gift. 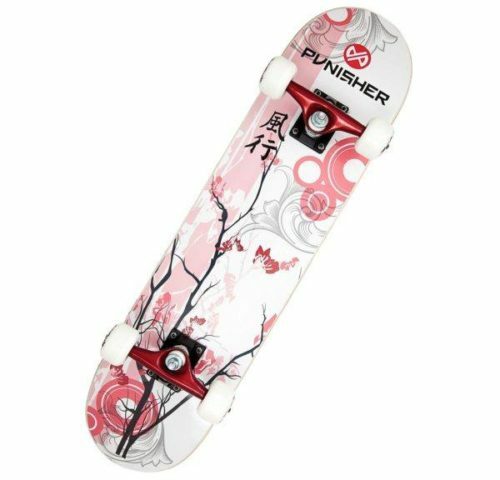 The Punisher is an awesome deal and offers all the quality and features one comes to expect from a great skateboard, but without the burden of high price and for this reason this got the top prize for the best budget buy here.